Washington’s plan called for a two-pronged, pincer-type, nighttime attack on the fortifications to be carried out by 1,200 men of his Corps of Light Infantry. According to 18th Century military doctrine, this was not enough men to take a well-prepared defensive position, but in addition to the element of surprise, Washington’s plan exploited a fatal flaw in the fortifications. British engineers had extended the wooden abatis 50 yards into the river in order to prevent attackers from approaching along a narrow beach at the base of the point, but low tide in the river meant men could wade around the end of the abatis. Washington gave Wayne his orders, along with permission to alter the plan if necessary. This was an unusual act for Washington, and indicates the high opinion he had of Wayne’s tactical abilities. The assault would be difficult: It would be carried out in the dead of night, it called for the men to scale the steep, rocky sides of Stony Point, and it required absolute surprise. To accomplish this last aim Washington ordered that the men attack with bayonets only in order to prevent a musket blast from alerting British sentries. Despite the difficulty of the plan, Wayne made only one change. He decided to use a small force to approach the fortifications from the landward side – exactly where the British expected an attack to come from. This group was permitted to load their muskets and to keep up a fire “sufficient to amuse the enemy” as a diversionary tactic. Wayne selected Col. Richard Butler to lead the northern column, Maj. Hardy Murfree to lead the diversionary attack on the British center, and Wayne himself would lead the southern column. 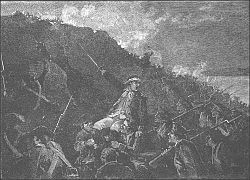 At nightfall on July 15, 1779, Wayne and his men marched south from West Point in three columns. The civilians they met along their march were taken into custody to prevent them from warning the British. The three columns rendezvoused at about 10:00 p.m. at a farm just a few miles from the fortifications. The men were given a rum ration and their orders. They were also given pieces of white paper to pin to their hats in order to help them tell each other from the British in the darkness. The three columns then moved out to begin the attack. Bad weather that night aided the Continentals. Cloud cover cut off moonlight and high winds forced the British ships in Haverstraw Bay to leave their posts off Stony Point and move downriver. At midnight, just as scheduled, the attack began. Murfree’s center column was spotted by British sentries and fired upon. Wayne’s column was discovered by the light of the muzzle blast of a cannon firing at Murfree’s men, but by that time it was too late to turn the cannon – Wayne’s men had succeeded in getting inside the British first line of defenses. Wayne himself was struck in the head by a spent musket ball and fell to the ground, leaving Col. Christian Febiger to take over command of Wayne’s column. Meanwhile, Butler’s column had succeeded in cutting its way through the abatis, although it sustained the only loss of life on the American side while doing so. The first man into the British upper works was Lt. Col. Francois de Fleury, a French nobleman serving on Wayne’s staff. He was followed by Americans named Henry Knox, William Baker and George Dunlop – all of whom earned cash prizes for their accomplishment. As the men hauled down the British colors they called out, “The fort’s our own!” – the prearranged password telling their comrades the battle was won. The battle had lasted less than an hour, yet it proved to be the major engagement of 1779, and one of the last major battles of the War in the Northern Theater. Wayne's losses were 15 killed and 83 wounded. 546 prisoners were taken, 74 of whom were wounded. Some Patriot sources stated that there were 63 British dead but military historian Mark M. Boatner accepts the official British report of 20 killed. However, the report (from Lt-Col. Johnson to Sir Henry Clinton on July 24, 1779) also lists 55 missing separate from killed, wounded, and captured, many of whom may have drowned in the Hudson. Before dawn, Wayne sent a brief dispatch telling Washington “The fort and garrison, with Col. Johnson, are ours. The men behaved like men determined to be free.” The next day Washington rode into the works to inspect the battlefield and congratulate the troops. For his exploits, Wayne was awarded a medal by Congress, one of the few issued during the Revolution. The Continentals, not having enough men to defend the site, chose to abandon it, but not until after carrying off the cannon and supplies captured there. The British briefly reoccupied the site only to abandon it shortly after as Clinton redeployed his troops to the southern colonies in anticipation of a French invasion. Some officer prisoners were exchanged immediately after the battle, but the majority of the garrison was marched off to prison camps in the wilds of Pennsylvania. Contemporary Patriot accounts note that Wayne had given quarter to the garrison of Stony Point despite the treatment of his own men at the "Paoli Massacre" in 1777. (One asserted that King George III fighting back tears when he heard of the “mercy” that had been shown to his troops). However, both sides took thousands of prisoners during the Revolution and the granting of quarter became a matter of routine. British reports also note that clemency was immediately shown the garrison. On July 16, between 12:15-12:30 A.M., British sentries signaled that something was amiss by firing at dark figures moving on either end of their outer line of obstacles. Within a few minutes of this, the Forlorn Hope chopped their way through and rushed toward the inner line of obstructions without firing a shot. The confused British sentries were still trying to figure out what was going on when Murfee's center column opened fire. The British troops immediately returned fire. Johnson rushed forward to organize his men and to focus the efforts against Murfee's demonstration. He then formed 6 companies, and moved them forward down the hill to strengthen their center. Wayne was grazed by a bullet across his forehead but remained in control of the assault. Both American wings breached the British abatis and poured into their perspective assault areas. Lt. Col. Francois de Fluery was the first man to breach the British lines. Johnson realized the desperation of his situation and that an organized defense was no longer possible. The close-quarter fight inside the British works lasted for about 15 minutes. The British garrison was now forced to surrender. A British soldier managed to escape, swim out into the Hudson River to the Vulture, and warn it about the surrender. The Vulture promptly moved downriver to avoid the fort's American-controlled artillery. The British at Verplank's Point and on the Vulture, when hearing the gunfire stop at Stony Point, shot into the air to congratulate their comrades on what they were sure was a British victory. The barrage was less than one hour and was conclusive evidence to them that the British at Stony Point had succeeded in repelling the American offensive. After establishing control of the site, an American artillery detachment used the guns of Stony Point to bombard Verplanck's Point. The American victory at Stony Point was the last major battle in the North, and also boosted American morale. Clinton's plan to defeat the Continentals and end the war had failed. Three days later, Washington abandoned Stony Point because he could not spare the men to continue to occupy the fort. He also knew it could not be defended against the combined might of the British army and navy.